UNIVERSAL EXTERMINATING CO., INC., of Mechanicsville, VA, was established 1971 providing pest control services for Central Virginia. 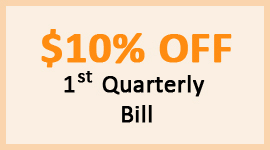 It's a locally owned/operated, award winning company with a reputation for professionalism and excellence. 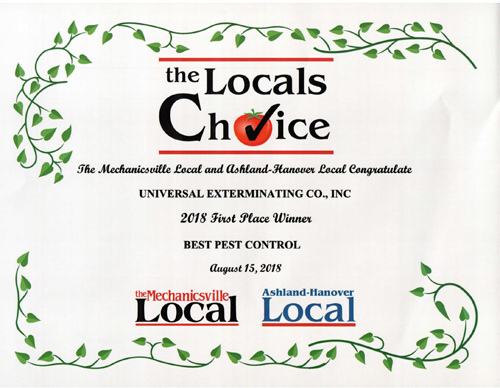 On July 27, 2016 and August 15, 2018, UNIVERSAL EXTERMINATING CO., INC. was awarded with "The Locals Choice's - Best Pest Control Award" by the Mechanicsville Local. As one of the Virginia's premiere pest control companies, we deliver a wide range of reliable, reasonably priced, corrective and preventative pest control services to our residential and business clients. As a responsible, environmentally friendly pest exterminating company, UNIVERSAL EXTERMINATING CO., INC., located in Hanover County, VA, follows an Integrated Pest Management (IPM) approach. We use only the latest and best pest control practices for the economic and environmentally friendly control of pests (i.e. minimizing possible hazard to people, animals, property, and eco systems). We are up to date with pest control techniques, pest identification, pest biology, safe and effective application of pesticides/rodenticides and Integrated Pest Management (IPM) techniques. UNIVERSAL EXTERMINATING CO., INC. creates a protective pest barrier around your home or business that stops the pests before they enter. Our certified Inspectors will identify the sources of infestations, entry points and nesting sites. Our uniformed, trained, experienced and certified technicians utilize proven comprehensive pest control methods that get the results you want. UNIVERSAL EXTERMINATING CO., INC. has proudly eliminated ants, termites, cockroaches, silverfish, fleas, spiders, rats ,mice, and more in homes and businesses throughout Central Virginia. Member of the National Pest Management Association (NPMA) committed to the protection of public health, food and property. We utilize the NPMA-33 for Wood-Destroying Insect (WDI) inspections for real estate inspections. Member of the Virginia Pest Management Association (VPMA insures that homes, restaurants, hospitals, office buildings, and other public spaces are pest free. Our inspectors hold VPMA Wood Destroying Insect Inspector Certifications, a license required by the State of Virginia, to conduct pest control or pest inspections in the state. Holds A+ rating with the Better Business Bureau, the leader in advancing marketplace trust. 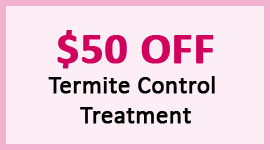 Let UNIVERSAL EXTERMINATING CO., INC. work with you to keep your life pest free. Our goal is to offer guaranteed, friendly, timely and professional pest control services to build a lasting, mutually beneficial relationship with our customers. Our reliable, local technicians understand the pest control issues encountered in Hanover County, Richmond, Henrico County, Chesterfield County, Aylett County, King William County and surrounding areas. 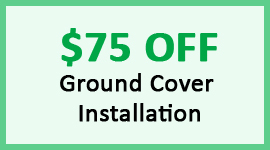 Call us at (804) 746-0561 or for a free estimate - click here. Why Choose UNIVERSAL EXTERMINATING CO., INC.? Award winning pest control company - "The Locals Choice - Best Pest Control"
"Consistently GREAT service. Honest, Dependable. 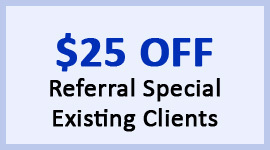 I have the utmost confidence when recommending them to my clients! "Dependable. I have the utmost confidence when recommending them to my clients! "Wonderful people, great service, and excellent prices! Enough said! Find out why so many home and business owners in Central Virginia trust UNIVERSAL EXTERMINATING CO., INC. with all their pest control needs. UNIVERSAL EXTERMINATING CO., INC. , of Mechanicsville, VA, was established 1971 providing pest control services for Central Virginia. It's a locally owned/operated, award winning company with a reputation for professionalism and excellence. Serving Hanover, Richmond, Henrico, Chesterfield, Aylett and King William Counties; the cities of Richmond, Mechanicsville, Glen Allen and Short Pump; and the rest of Central Virginia. © UNIVERSAL EXTERMINATING CO., INC. 2016. All rights reserved.